Garrett AT Pro Review - The #1 Coin and Relic Hunting Detector? Thinking of buying the Garrett AT Pro? In this review, I analyze the features, field performance and value of this popular detector to help you decide whether it’s the right choice. 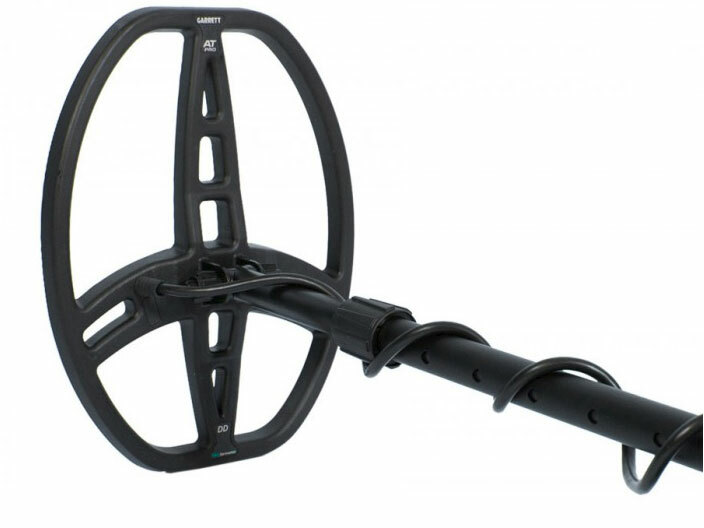 The AT Pro is arguably Garrett’s most famous metal detector. It’s part of the AT series, which also includes the Gold and MAX, and aims to provide professional-standard performance for a very reasonable price. Features of the AT Pro include Iron Audio, notch discrimination, manual and auto ground balance, a pinpointing mode and numerical target ID. It’s also relatively simple to use. 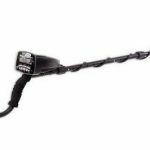 How does the AT Pro compare to other metal detectors in this price range though? And how effective is it at hunting treasure in a wide range of environments? Keep reading to find out. Can I use it to detect gold? 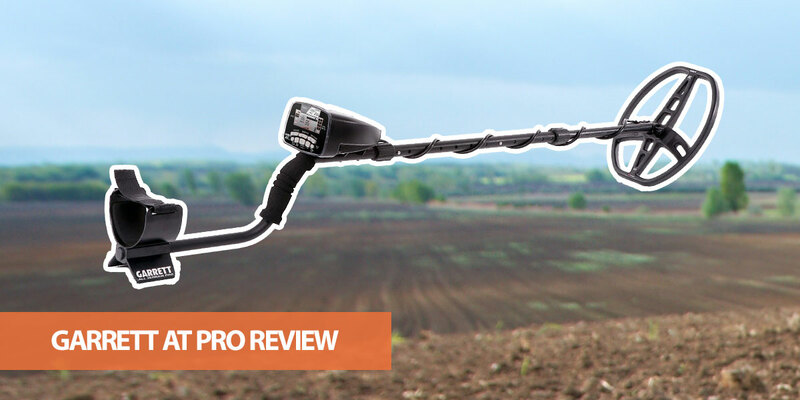 At its core, the AT Pro is a VLF metal detector that’s designed to be an all-purpose machine. It’s powered by 4 AA batteries, so I highly recommend buying rechargeable cells to save money over time, and has a padded arm rest for extra comfort. The “AT” series stands for “All Terrain." As this suggests, the Pro is a rugged machine with a durable exterior. Whether you’re hunting at a beach, desert or local park, it can handle almost anything you can throw at it. The detector also requires minimal maintenance. What is it built to detect though? The AT Pro is best at hunting coins, relics and jewelry, but can make a decent stab at gold nuggets due to its 15kHz frequency and ground balance settings (although for serious gold prospecting take a look at my list of the best gold detectors here). The detector comes with a 8.5” x 11” DD PROformance coil. This provides decent target separation and depth for a stock coil. It's a solid choice for an all-round coil that's suitable for most situations. For more specialist tasks, Garrett offers a range of other coils for the AT Pro, including a sniper coil and 9”x12” concentric coil. It’s also a lightweight machine. At just 3.03lbs, you won’t get fatigued when swinging it for long periods. Most of all, I’m impressed by how many features Garrett has managed to pack into the AT Pro. Despite the wide range of options and settings, it also remains simple to use - especially on the Standard audio mode. The AT Pro is fully submersible to a depth of 10 feet. It’s great for hunting in shallow water, such as creeks, rivers, lakes and even the sea. While most detectors have a waterproof coil, it’s surprisingly rare for a detector to be fully submersible unless it’s designed specifically for water hunting. The AT Pro is one of the most versatile detectors in this regard. It’s not suitable for diving though. You’ll need a detector with a much higher depth rating for hunting shipwrecks or scuba diving - click here for a list of top models. Garrett also hasn’t included waterproof headphones with the AT Pro - you’ll need to buy those separately. I suppose this isn't surprising, as a good set of submersible headphones can be expensive, but it would have been nice for the stock package to be fully waterproof. The Garrett AT Pro has a 15kHz operating frequency. This is higher than many VLF detectors in this price range (including the Fisher F75), although it’s lower than the 18kHz of the AT Gold. There are several advantages to a higher frequency. Firstly, the AT Pro is brilliant at detecting small targets and provides excellent target separation. The higher frequency also makes the detector more suitable for finding gold nuggets than other VLF models - especially with the excellent ground balance function (more on that in a moment). Keep in mind that the AT Pro is a single frequency detector. There is the option of making minor adjustments to counteract interference from powerlines or other detectors, but it’s not a multi-frequency detector. This isn’t a complaint - the vast majority of VLF detectors are single frequency - but there is often confusion when people see “frequency adjustment” listed as a feature of a detector. There are two audio modes: Pro and Standard. Both modes can be used with the three search modes, but provide a very different audio experience. Standard mode is great for beginners. It uses three audio tones depending on the metal conductivity. If you’ve used an ACE detector in the past, you’ll feel instantly at home with the signature Garrett bell-tone for coins. The audio tone doesn’t provide much additional information about the target though. In contrast, the Pro mode provides audio information about the target depth and composition. You still have all the same discrimination options, but deeper targets provide fainter tones and there may be additional snapping depending on composition. It takes some practice to use, but once you’re comfortable with the Standard mode it can improve your results - especially in regions with lots of iron trash. I recommend starting with the Standard mode if you’re new to detecting. Once you get the hang of the Pro mode, however, I don’t think you’ll want to switch back. The AT Pro has a large numerical target ID in the center of the screen. This is on a 0-99 scale and provides more accurate information about the target’s composition than the category read-out. While numerical target ID is a standard feature on mid-range detectors, it’s useful for estimating target metal type. Garrett has also ensured the detector is fast at providing a target ID - especially when it’s been properly ground balanced. There are 40 segments for iron discrimination. By adjusting this setting, you can either knock out all ferrous targets or dial back discrimination depending on what you're hoping to find. Setting iron discrimination to a higher value is often a good idea for ignoring nails and similar junk (around 30-35 is a good place to start). But if you’re hunting for relics, you may want to set it lower to avoid missing real targets. As I mentioned, the 40 iron discrimination segments provide fine control over what is accepted at the lower end of the conductivity spectrum. This is great for getting rid of highly ferrous objects - but it won’t help ignore foil or pull tabs with higher conductivity. For this reason, there’s also a useful notch discrimination feature. At conductivities above the iron region, there are 12 discrimination segments that can be accepted or rejected. Notching out a segment is as simple as scrolling to it and pressing the “ELIM” button. It’s worth pointing out that the notch feature is used in CUSTOM mode, but ignored in ZERO search mode. ZERO isn’t a true all-metal mode but it performs a similar role. There’s also a pre-set “COIN” mode. This has foil, iron and pull-tabs already notched out, so it’s great for beginners who want to go coin shooting. You can also use the ELIMINATE button to remove a current target from a discrimination pattern. If you’re getting a choppy signal over an object you’re sure is trash, just hold down the button and it’ll be rejected from the pattern. Of course, you need to be careful about using too much discrimination. Real targets vary greatly in composition and size, so it’s easy to accidentally reject items you should be digging. It’s a brilliant feature though that can save you a lot of time digging unwanted trash. When you run the AT Pro in CUSTOM mode with iron discrimination turned up, you won’t hear any nails or similar trash items. This is often what you want - especially when there’s lots of trash around. The audio feedback changes when you turn on excellent Iron Audio mode though. Discriminated iron objects now trigger an audio tone, which is great for helping you decide whether a target is worth digging. A bottle cap, for example, may appear like a quarter when the iron discrimination is turned up to 30-40. If you get an additional grunting tone with the iron audio turned on, you can probably guess it’s a trash item. A clean tone, on the other hand, hints the object is a real target. Iron Audio tones are lower than regular tones (often described as grunting), so they are easy to distinguish from real targets. You can’t use Iron Audio in “ZERO” mode though, which is a shame. Note: This feature is included with other AT models and the ACE 400. Other ACE models, such as the 250, don't include it though. An important feature of the AT Pro is that it has both automatic and manual ground balance. This allows you to ground balance depending on the mineralization in the soil, so the detector is capable of hunting in areas with high mineralization or even saltwater (click here for a list of the top saltwater detectors if you're planning on beach hunting). It also improves depth and cuts out chatter caused by ground mineralization. Automatic ground balancing is simple and quick. Simply hold down the “GND BAL” button and the machine automatically calibrates according to the current ground conditions. In most situations, the automatic ground balancing function does a great job, so you won’t need to use the manual setting. It’s available if you need it though. Tip: Always ground balance the machine when you switch it on. You’ll get much better results if the machine is properly calibrated to the ground conditions. Make sure you’re not over metal when ground balancing though! Coin Depth Indicator. There’s an estimated depth indicator on the right hand side of the display. This ranges from 2” - 10” inches and is useful for knowing how deep to dig your plug. Sensitivity. Like all the AT models, the Pro has eight sensitivity segments. The higher the sensitivity the deeper the detector can search, but you can reduce it if you get too much chatter and falsing. Pinpointing Mode. 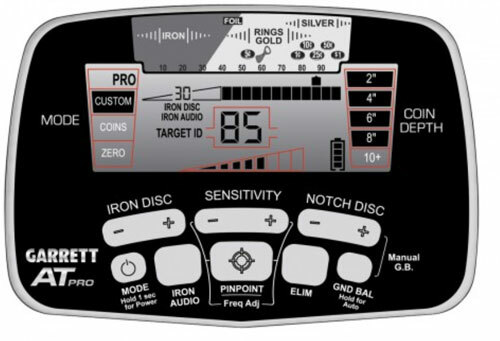 The AT Pro has a built-in pinpointing mode for more accurate target locations. If you’ve used a Garrett ACE machine before, you’ll feel comfortable with the AT Pro. It has a similar design and layout - although the black color scheme provides a more professional appearance. Most importantly, I feel the AT Pro’s control panel is easy to use and read when in the field. At the top of the control panel, there’s a legend showing potential target categories. These are useful for getting a quick idea of what the target is likely to be, although you’ll probably rely on the audio and numerical target ID most of the time. The legend is more useful when creating custom discrimination patterns. By using the “NOTCH DISC” button, you can accept or rejects segments for more control over what you dig. Like all settings on the AT Pro, this is simple and intuitive. The buttons are also clearly labelled. The display isn’t perfect though. It doesn’t come with a backlight, which can make hunting in low-light conditions or in the middle of the day frustrating. There’s also no option for threshold adjustment, no volume control and the legend can sometimes be difficult to view. These are minor complaints though. Garrett has done a great job of making the AT Pro easy to use. The Garrett AT Pro isn’t a cheap metal detector. With an MRSP of over $600, it’s aimed at serious detectorists who want to upgrade from their entry-level machine. When you consider the value it provides, however, there are very few detectors that can match its features and performance for a similar price. If you want a professional-standard detector that will provide years of top-level detecting, the AT Pro is a great choice. It’s also a popular machine, so you can find it at for sale at most retailers with a metal detecting department - including Walmart and Amazon. If you decide to buy a used or refurbished AT Pro (from eBay or Craigslist), make sure you know its condition before you buy - and avoid counterfeits at all costs! The AT Pro provides excellent performance in the field. I really can’t speak highly enough of how fun and effective it is to use. With its combination of iron discrimination, notch discrimination and iron audio, it’s great at filtering out trash so you can focus on finding rings, coins and relics. It’s also simple to use, so you won’t need to spend weeks learning its functions. One of my favorite features of the AT Pro is its fast recovery - especially in Pro mode. This allows it to separate closely spaced targets which is great for finding targets hidden by trash. The AT Pro also provides excellent detection stability when out in the field. You can often run high or even maximum sensitivities unless there’s particularly high levels of mineralization. If you’re getting a lot of chatter, the Pro still maintains decent depth even on lower sensitivity. In terms of depth, the detector can find targets to around 8” or even 9” in some cases. You’ll need a different machine if you want to detect deeper than this though. It’s not the best at finding gold though. While it’s fine for locating the occasional gold necklace or larger nuggets, it doesn’t have the high frequency required to locate small nuggets or flakes. For hunting silver coins, ancient relics or valuable jewelry, however, it’s one of the best detectors on the market. Note: Make sure you read the manual and watch a few YouTube tips and tricks videos before you head into the field. You’ll get a lot more out of the machine if you understand it's features. The AT MAX is the most expensive model in the AT series. It comes with a few extra features, including 44 iron discrimination segments (compared to 40 on the AT Pro), integrated wireless headphones and a true all-metal mode. There’s also an additional search mode. There are some advantages to the AT Pro though. Aside from a lower price, the AT Pro has a higher operating frequency so it’s more effective at finding small targets (although not as effective as the AT Gold). The AT Pro also allows you to choose between Pro and Standard audio, while the AT MAX only has Pro. This makes the MAX less suitable for beginners. Both the AT Pro and Teknetics T2 Classic are popular detectors with similar features. They both have an 11” search coil, manual ground balance, numerical target ID and a pinpointing mode. While the T2 Classic is cheaper, I prefer the AT Pro in most situations. The Iron Audio function is great for avoiding trash that would otherwise appear as real targets, but this isn’t included with the Teknetics. The easy notch and iron discrimination modes, combined with the submersible design, are also advantages over the T2. The AT Pro and AT Gold are two of the most popular detectors on the market, so I often get asked about the differences. As this is a common question, I wrote a more in-depth comparison which you can find here. The standard AT Pro package includes the 8.5”x11” DD search coil, headphones (not waterproof), an instructional DVD and manual. This is just the standard package though. Many retailers sell other packages that include items such as pinpointers, pouches, bags and even accessory coils. Garrett also offers a 2-year warranty on the AT Pro. Yes, all metal detectors have the capability to detect gold - including the AT Pro. The real question is whether a detector can handle the high levels of ground mineralization where gold nuggets are found. While the ground balance features of the AT Pro make it capable of hunting in hot ground, it doesn’t have the sensitivity to detect tiny gold flakes or nuggets. If you’re serious about gold detecting, look for a model that’s designed specifically for this purpose. 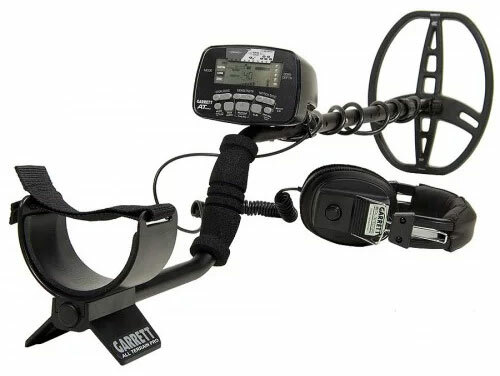 The Garrett AT Pro is an outstanding metal detector - especially considering the mid-range price - and it's well-deserving of a place on my list of the best detectors. You’ll often hear experienced detectorists praise the AT Pro even after buying more expensive detectors. This is mainly due to its rapid recovery time, easy-to-use features and excellent performance. It’s also a highly versatile detector. If you’re not sure where you’re going to hunt, this is the model to take with you. Like all metal detectors, there are some drawbacks. The lack of a backlit screen, for example, can be annoying in certain light conditions. I also would have liked Garrett to include waterproof headphones - especially as it’s advertised as a fully submersible detector. These are minor complaints though - and I almost feel guilty making them as there is so much to like about this model! To summarize, the Garrett AT Pro is a high-quality detector that provides great value for money. If you’re serious about metal detecting and ready to upgrade from an entry-level detector, you won’t be disappointed.